What a day, what a day. After a long drive out to Wilton for the annual Strength For Sydney 5K fundraiser for the Smith-Magenis Syndrome Research Foundation – we made the short drive over to Redding’s New Pond Farm during their Harvest Festival. 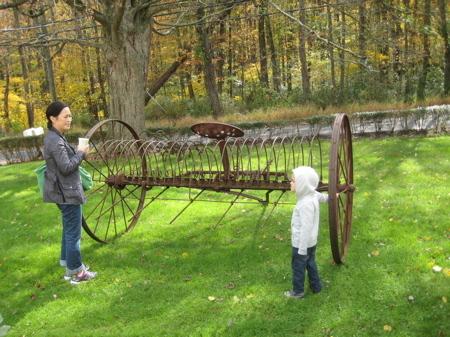 I didn’t subject anyone else to the hot dog, after which we drove over to the farm. There was a nice crowd there, but nothing crazy. The festival was $5.00 per person over 3, which I can appreciate but with Damian after a tiring event, we figured we were probably throwing money away. And that certainly appeared to be the case once we parked. Damian went into full-on SMS tantrum mode. Running away, screaming, lots of self-injury. I sort of carefully ushered him down the hill into the woods for him to do his thing and tried to soothe the situation while Hoang changed his baby brother. It took a lot of patience and persistence on my part, but he finally came around (as far as he comes around in such situations). 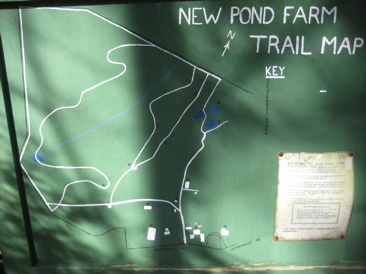 New Pond Farm is celebrating its 27th anniversary [in 2012] as an environmental education center with a small working farm! Our mission is to connect people with the land that enriches and sustains us all. 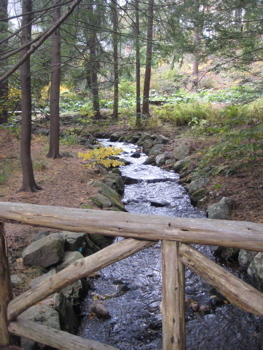 Our beautiful 102-acre property, once owned by our founder actress Carmen Mathews, is an outstanding outdoor classroom: we have a variety of habitats for our environmental programs including woodlands, wetlands and pastures. 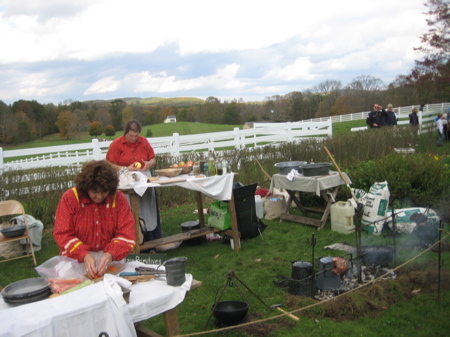 Our Native American programs are enhanced by an authentically-recreated encampment. Our astronomy buildings are home to monthly astronomy programs as well as being the field station for Joel Barlow High School’s astronomy classes. Our vegetable and herb programs are featured in our Shared Harvest Program. 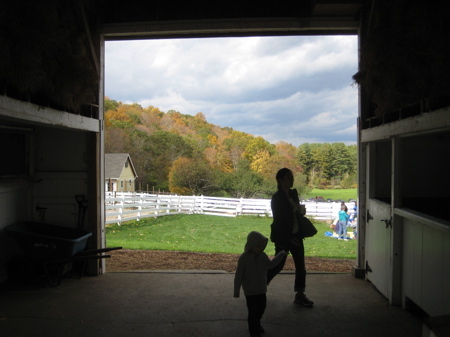 Our farm programs take place in our barns, which house milking cows, sheep, chickens and roosters. 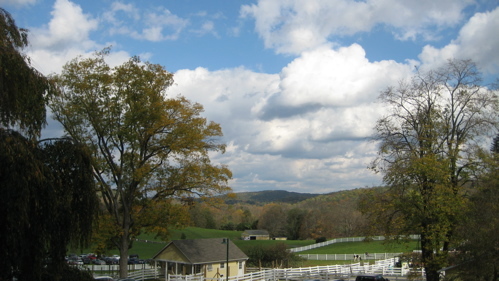 Our barn-like Learning Center with its classroom and spacious meeting areas has been the site of art shows, adult lectures, barn dances and more. 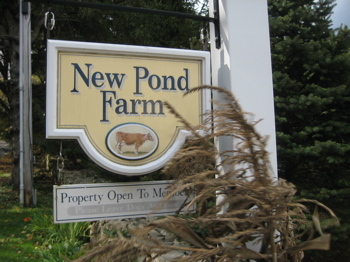 In 2007 New Pond Farm was designated a Connecticut Dairy Farm of Distinction, people visiting our Dairy Annex may purchase our freshly pasteurized milk and yogurt. 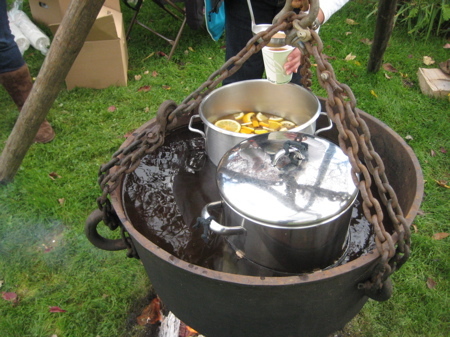 In the summer we host a small and personal residential camp. 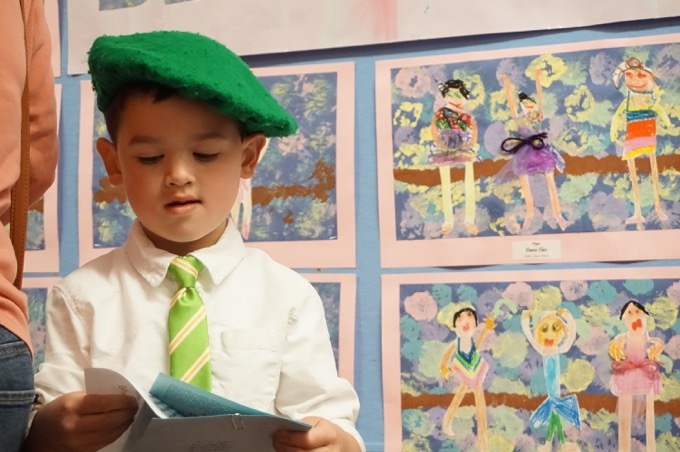 During three ten-day sessions, we bring together children from the inner cities of Connecticut with children from the surrounding area. Together these youngsters, aged 8-12, from diverse socioeconomic and ethnic backgrounds form friendships, develop an understanding and appreciation of one another as individuals and have a marvelous time discovering the many wonders of the farm. I like that last bit. Because let’s be honest here; West Redding and its surrounding towns (Bethel, Newtown, Weston, Wilton, Ridgefield ain’t exactly bastions of “diverse socioeconomic and ethnic backgrounds.” Granted, Danbury isn’t too far north and it’s great to read they draw from there as well – or so I’m assuming. If you wish to learn more about its founding and the actress you’ve never heard of who started it all, read this page about its history. I did. This place will (or should, anyway) garner three separate pages here on CTMQ. This one you’re reading, one for the observatory and another for its trails. Despite Damian’s initial issues, we ended up have a grand old time at the “environmental education center” as well as the different parts of the festival. Even Calvin seemed to enjoy the day as well. 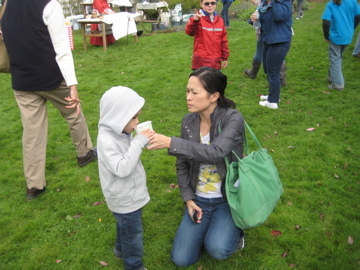 I especially like how Damian is looking at her like, “Aw, c’mon mom, it’s not so bad!” And it’s not. Not at all. In the winding staircase up to the second floor, there was an extensive collection of Al Hirschfeld comics for some reason. 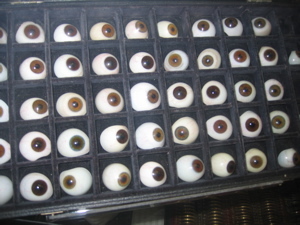 Perhaps there was an explanation somewhere and I missed it, but I enjoyed the sheer randomness of the collection. 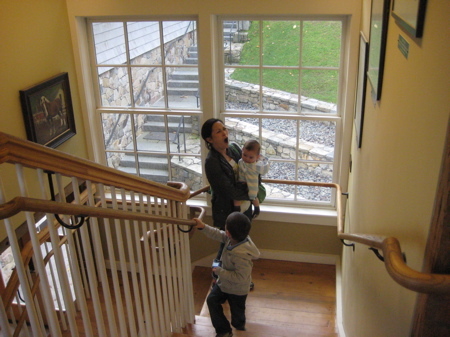 The beauty continues as you climb the winding staircase and enter the Common Room, which is a wonderful home for our summer camp. It begins with a gracious living room and state of the art kitchen and also includes four spacious bunkrooms. 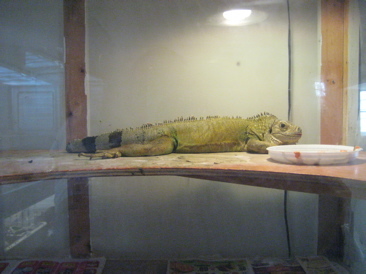 The second floor gets away from the live reptiles and moves into more of the natural history world. 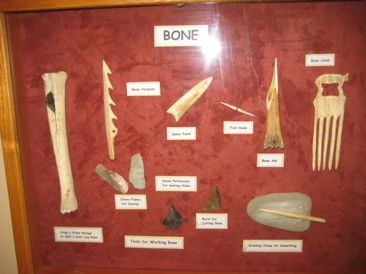 There are extensive displays of Native American artifacts and explanatory displays explaining how they lived in the area back in the day. While again, there’s not much we haven’t seen before here but I really liked the clear and professional displays. 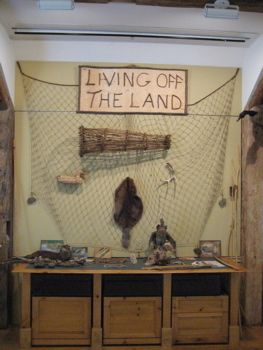 As this room is used for education and as a gathering place for youngsters to learn about natural history, the mere fact that they put the effort into displaying all this stuff here is really just a bonus. 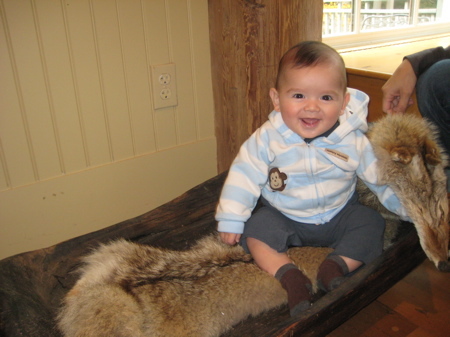 And how often do you get to plop your six month old onto a coyote? Or a wolf, I can’t tell. 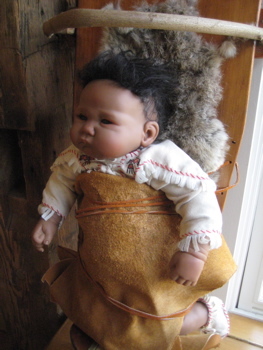 But really, if you’re fixating on the pelt and not the beautiful little boy, you’re a nut. The barn-like Gathering Place, also on the upper level, is breathtaking with its soaring cupola, antique wood and gracious windows that frame views of woodlands and pastures, focusing your attention on the beauty of New Pond Farm. They aren’t lying. The views here are magnificent. 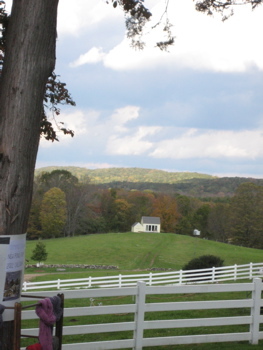 Western Connecticut is just a strikingly pretty place; and one that never gets the credit it deserves. It was time to leave the papooses and arrowheads and head outside to the outdoor displays. 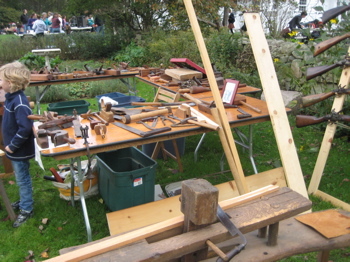 Now, I don’t know how much of this stuff is available to you if you were to visit on a non-festival day. 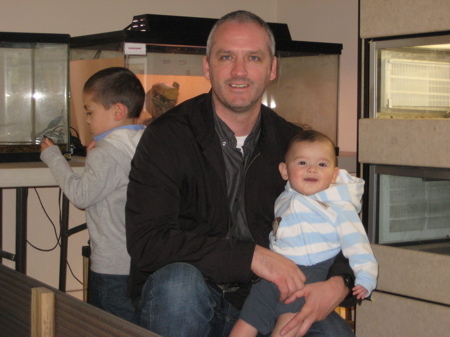 I’m also not sure how much you’d care because most people don’t “need” the complete museum experience that I do. But that’s neither here nor there. The festival is a homey affair. It’s quite small and it seemed like everyone knew everyone but us West Hartfordites intruding upon Redding’s quaint little farm fair. That’s not to say were weren’t treated well – we absolutely were. In fact, the whole vibe was super friendly and happy. Such is life in the well-heeled hills of northern Fairfield County. 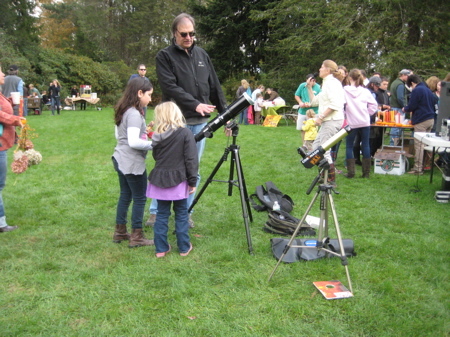 While Fake Brian Billick showed youngsters a sun spot through a specialized telescope. I wonder how many people who actually read this know who Brian Billick is? Probably none, but it made me chuckle at least. Fake Billick was cool; he and I chatted about the observatory on a nearby hill and I promised to make it back out here on a clear night during one of their open house nights. Honestly, I can’t wait. I just imagine that on a crisp autumn evening, out here in West Redding, the skies are just… just… cooler somehow. 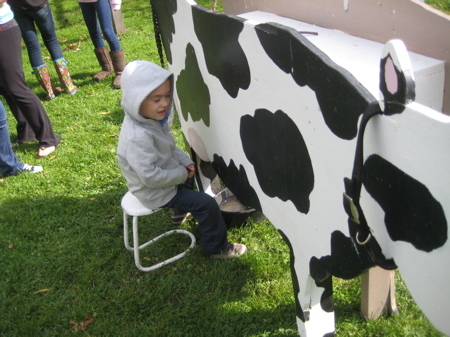 There was a display of old farm implements and Damian enjoyed “milking” the fake cow for a bit. The festival was a small affair and we didn’t get to walk any of New Pond’s trails, including the one with the “authentic replica” of a teepee. Oh well. We walked through the barn and checked out the cows and chickens and whatnot before heading home. One last important note about New Pond: It’s private. You have to join them to visit them, unless of course you go during their two annual festivals. Which, if you’re not from the area, only makes sense. Although membership does help fund a very worthwhile set of programs, if I joined every place that I visit I’d be broke. They do have a whole bunch of Members Only events like caroling, Easter egg hunts and pancake breakfasts. 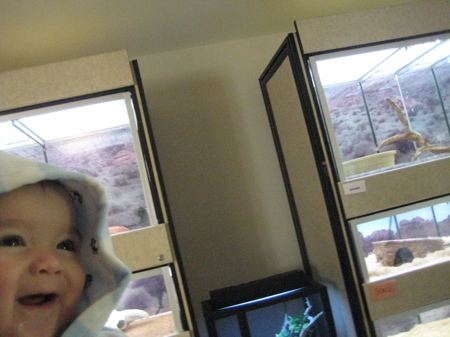 And if you’re a member, you can go there and hike around or cross-country ski or just take the kids to play with the tortoise. So think about it – they seem like a good group of folks.